Himalaya Herbals is a brand that I got in touch with when I was travelling in India. That time I was having some pesky skin troubles and it was thanks to their facial wash that helped soothe my skin for the trip. The brand boosts of 100% natural and safe products, so I used it with a piece of mind and I have never stopped using their products since then. This month, Himalaya Herbals is going back to the roots of beauty with their latest campaign - "The Root to Beauty". The spotlight will be shining on to its range of Turmeric and Neem skincare products. It's very intriguing to hear Turmeric being used in beauty range, I always hear about it being a herb used for cooking, mostly in curries. 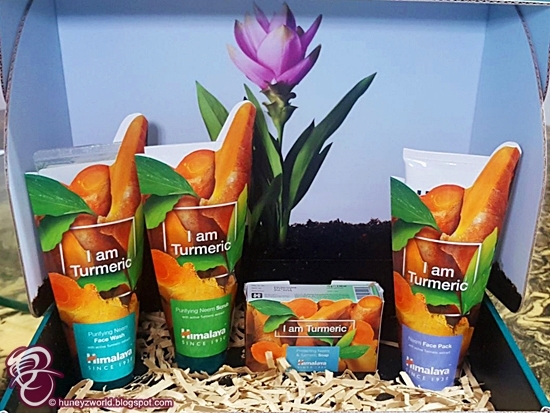 So, when the chance comes to test and try out this new series of Turmeric and Neem products, I definitely hopped onto the wagon. Yup, as you can see, the Himalaya Since 1930 "Root to Beauty" range of products w are all accompanied by the newly designed turmeric rood product sleeve, super easy to spot on the retail stores' shelves. They are all now available at Watsons, Guardian, NTUC, Giant and Mustafa as well as NHG Polyclinics, ranging from S$7.95 to S$12.95. So, do share and give the Himalaya Herbals Turmeric & Neem products a try!